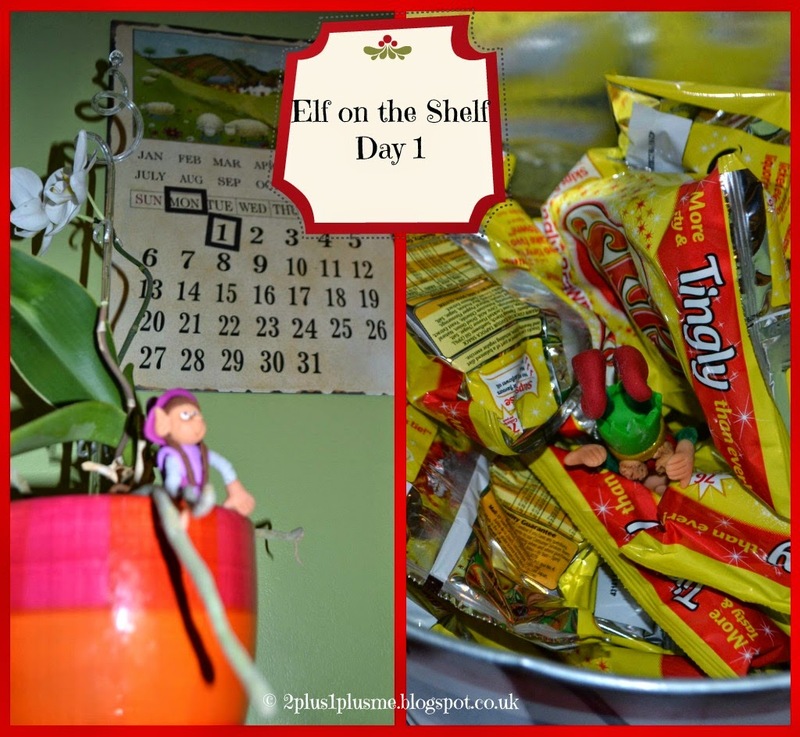 2 + 1 + Me: Elf on the Shelf Returns! Blimey o'riley - where has the past year gone?! It's time for the elves to make their return. Now - I must confess that this year is nowt to do with me. Mr H seems to have avoided doing anything to do with Christmas, he hasn't thought about what to buy people, bought it, wrapped it, written cards, ordered the turkey - nowt. In fact he was given ONE job and that was to deliver the wrapped presents and cards for his sister, niece and nephew and parents on a weekend trip to visit them. I have used the word baubles in place of a different word - and so alas, their bag of gifts (yes, I'd bagged them up ready to go) are now still sitting here in the dining room. In a state of miffedness (this may be a new word but I like it) I told him he could be in charge of the elves antics this year. We haven't got our tree up yet, we're waiting for the weekend so we can spend lots of time making it look like we've just thrown stuff on it (there's an art to it you know ;)) so the elves had to make a different appearance. The girls woke up to find a letter from Santa dangling outside their bedroom doors saying that the elves had arrived but there had been a problem with their landing. Mr H almost got it right...he printed a letter out but didn't put it on Santa's headed paper like I did last year (you see - its the little touches men forget). They came downstairs to find Little Miss L's elf head first in a bucket of crisps and Miss R's elf watching. The kids were thrilled that the elves are back! They still talk about the day the elves made snow angels on the cooker with the flour and how naughty they were! "YOU MUST NOT TOUCH THE ELVES"
and so Miss R donned her long blue Elsa gloves and got some tongs from the kitchen so that she could move the elves to a 'bed' they made for them. Rolling down the stairs in loo roll tubes (TP tubes for those of you in the US). He needs to work on his photography but I love the one of Jolly Toe Bells pushing Peppermint Tinker off the step!! Glad the elves arrived back safely. Thinking cap on Mr H!